Jesse Jones and 2011 champion Dan Couzens took two wins apiece in the opening round of the BMCRC Minitwin championship, as the popular series provided some of the weekend’s best racing, just like it did over the course of the 2011 season. Former Superteen rider Jesse Jones looked set to take a brace of wins on Saturday, however technical infringements saw him and three other riders disqualified from the results of the second race. In race one Jones, on a Steve Jordan prepared Suzuki Gladius in an SV650 dominated field, hit the front from pole position, but soon surrendered the lead to Dan Wright, as five riders broke away at the front. Starting the last lap and Wright held the advantage from Jones, with Couzens on the Team V Speed Suzuki in third. Tony Russo and Seb Kelly were hanging in there in fourth and fifth, however their races ended early; the pair of them crashing out together at Palmer. Jones snatched the lead back from Wright, and took his first win of the weekend, with Wright second and Couzens third. In race two Jones looked set to take his second win, crossing the line ahead of Couzens and Wright, however, both Jones and Wright were disqualified for exceeding the horsepower limit, and exempt from the results. Tim Moorhead was also disqualified. Couzens was awarded the win, with Ashley Buxton second and Simon Schug third. On Sunday morning Jones, Wright and King had to come from the back of the grid, allowing Couzens to get away at the front with 2011 Rookie Minitwin Champion Schug and runner up Buxton. But at the start of the second lap Wright was up to sixth and Jones eighth. Come the start of the fifth lap and the usual suspects were in the podium positions, with Couzens leading Jones and Wright, with Buxton in fourth. The positions remained the same going onto the last lap, before chaos ensued as they entered Murrays for the last time. Jones ran it wide at Corrams in a bid to get the inside line for Murrays, however, he ran in too hot, and forced Couzens onto the grass. Jones did remain on the track, and took the win. Buxton also got the better of Wright to take second, Couzens rejoined to get third, and Wright had to settle for fourth. Couzens took his second win of the weekend in the final race, after Buxton threw away a one second lead starting the last lap. Couzens and Jones found their way by to take positions one and two on the podium; Buxton had to settle for third. Technical issues meant Dan Wright didn’t make the start. The opening round of the BMCRC Premier 600s started with 2011 Stock 600 champion Jordan Simpkin taking pole, and he was joined on the front row by Jody Lees, Anthony Cooper and Matt Ogden. In race one Lees and Simpkin got away at the front, however, with the pair of them competing at national level in 2012, they were exempt from the points. Behind, Cooper slotted into third and set about gapping Piers Hutchins in fourth. However, a late race surge from Hutchins saw him battle back, and even though he had to settle for fourth, he made Cooper work hard to fend him off, with the gap at the flag less than one tenth of a second. Sixteen year old Luke Helm, who was the 2011 Minitwin runner up, came home fifth in his first outing on his SDC sponsored Kawasaki ZX-6R, and third in the points. Race two and it was another two horse race at the front, this time between Simpkin and Cooper. Simpkin triumphed, but Cooper showed he could run at the same pace, and was second by just over half a second. Behind, Helm, Hutchins, Matthew Shellcock and Matt Ogden were locked in a thrilling dice for third. Helm held the position starting the last lap with Hutchins chasing, while Ogden dropped from proceedings a lap earlier. But it was Hutchins who got to stand on the remaining step on the podium. Helm in fourth was the third rider in the points. Shellcock, Tom Hayward and reigning Superteen champion Max Symonds were fifth, sixth and seventh, and split by just half a second. 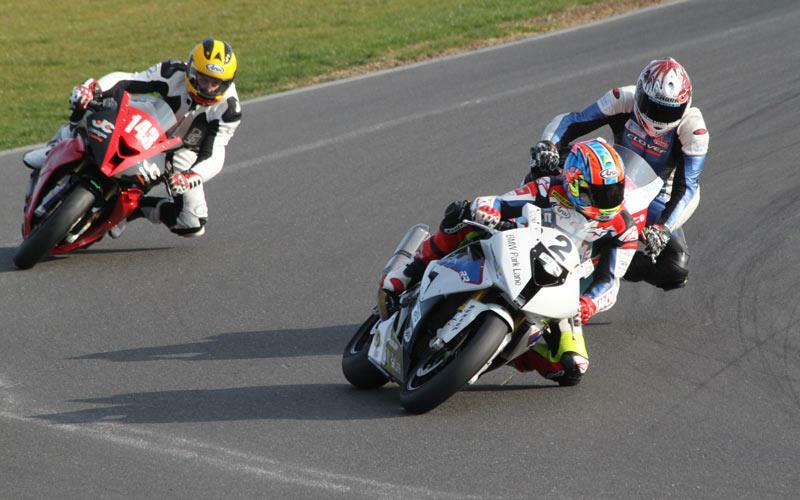 On Sunday, Go Racing’s Simpkin took another win in the morning on his Yamaha R6, this time ahead of SDC Kawasaki’s Helm. Shellcock was third and Cooper fourth. It was a thrilling battle for the lead, which saw Simpkin, Helm and Cooper fighting the win. Helm hit the front at Montreal on lap five, and after Cooper made a mistake and dropped to fourth, he managed to put a gap in to Simpkin. Simpkin put in a string of quick laps, but Helm held on to win by two tenths of a second. In the final race, Cooper and his Yamaha R6 disappeared into the distance to take the win by 10 seconds from Simpkin. 10 seconds behind him Helm took third after a battle with Shellcock. Dan Fowler took all three wins in the team Respro BMCRC Premier and Stock 1000s on the MG Sear Planthire Honda Fireblade, after he qualified on pole position ahead of John Waghorn and Seb Bulpin. Michael Neeves qualified fourth and was the leading Premier 1000 on the BMW Park Lane S1000RR. 2011 Powerbike champion Rob McNealy destroyed his S1000RR in qualifying and didn’t make Saturday’s race, along with Lloyd Sutton Foster, who also wrote off a BMW. In Saturday’s race Fowler hit the front from the off and led to the flag, three and a half seconds ahead of second placed Waghorn, who had a lonely race. From then on, the front three remained the same until the chequered flag, with Michael Neeves also the leading Premier 1000 home. However, there were worse fortunes for Bulpin, who dropped out of proceedings on lap six. That promoted Edwards to fourth and 2011 Rookie 1000 rider Westley Crozier to fifth. On Sunday Fowler stormed to another early lead followed by the usual suspects, however the race was red flagged after McNealy, coming from the back of the grid, crashed at Oggies on lap three. After the restart Fowler got away at the front again, leaving Bulpin, Neeves and Waghorn to do battle for second. Neeves eventually bettered Bulpin on lap four, and went on the hunt for the race leader. And with a string of fastest laps, he caught him, too, and was unlucky to not take the win, finishing second by four hundredths of a second. Fowler took the win, but Neeves was leading Premier bike home, with Stock runner Bulpin, third. In the afternoon Fowler took his third win, this time ahead of Waghorn on the JW Smart BMW, with Neeves third and again leading Premier 1000. Three winners in four races in the Rookie 600s was testament to the weekend-long battles at the front, with five different riders standing on the podium over the course of the meeting. In race one, eventual winner Ben Gallaway on the Cornerstone Garage Yamaha R6 crossed the line elbow to elbow with second placed Benn Doolan on the Triumph 675, with Sam Fleetwood in third. Fleetwood, on the Fleetwood Grab Services Yamaha R6, went better in the afternoon, taking the win, half a second ahead of Gallaway, with Alistair Dayus third. Fleetwood took his second win on Sunday morning with a 12 second gap back to the battle for second. JRR Racing sponsored Jake Robertson on a Triumph 675 took his first podium with second, while Dayus took his second third placed finish of the weekend. Robertson took the final win of the weekend, with Dayus getting his best finish of the weekend with a second. Fleetwood was on the podium again with a third, and left Norfolk leading the championship. In the new crop of BMCRC Rookie 1000s Danny Campion on the A-Skips Yamaha R1 took three wins and a second, with his nearest rival Michael Honey taking three seconds and a win on the ex Rob McNealy Suzuki GSX-R1000. Steve Paddock took third in race one on Saturday on a Suzuki, before Yamaha R1 mounted Ian Pearson took the bottom step of the podium in the afternoon. Pearson took both thirds on Sunday in a strung out field. The new Rapid Solicitors sponsored National Junior Cup, which uses evenly matched Kawasaki Ninja 250Rs, had an unofficial round ahead of their opening points scoring round with British Superbikes over the Easter weekend. Rowan Miller comfortably took all four wins after qualifying pole, with Mason Law taking all four seconds after battles with Aaron Maxfield, Stefan Hill and Adam Cross. In race one Law, Maxfield and Hill were all vying for second, and on the last lap three went into Murrays, but only two came out, as Hill went down. Red flags meant third went to Maxfield. In race two Cross took third behind Miller and Law. On Sunday Maxfield took a brace of thirds, seeing off challenges from Hill, the gap between them just two hundredths of a second in race three. Reigning MZ champion Andy Saunders took all four wins in the first round of the BMZRC championship, in the year of their silver jubilee. Saunders’ winning margin was never less than three seconds, getting his title defence off to a great start. Dean Stimpson took three seconds and a third, proving to be a headache for former champion and 2011 runner up Chris Rogers, who would have been hoping to be closer to Saunders over the weekend. Rogers did take second in the final race, however, to go with two thirds and a fifth. Darren West took the other podium position available over the weekend, with a third in race two. Rob Eyre put his Ducati 916 on pole in the BMCRC Thunderbikes and took three race wins after the disappointment of being disqualified from the results in race one. In that race the win went to Ian Davis from Michael Simmons and Adam Nelson. In race two Eyre took his first win, with Simmons again second on his Yamaha TRX850 and the Tigcraft SV700 of Steve Parrot third. Eyre took both wins on Sunday with Mark Crisp second on both occasions. Simmons and Parrot shared the bottom step of the podium. Colin Martin and Richie Welsh shared two wins and two seconds each in the EDI Asia Formula 400s, to leave Norfolk level on points. Martin took pole and the win in race one, before being bettered by Welsh in race two, while Andrew Gill was third on both occasions. On Sunday and Martin and Welsh repeated the antics of Saturday, this time with James Runham and Gary Hennings sharing the bottom step of the podium. In the popular BMCRC Open Championship, Waghorn Lees and Bulpin were on the podium in race one, before McNealy crashed the party in race two, coming in and taking the win from Waghorn and Lees. On Sunday Waghorn took his second win from Bulpin and Nicky Wilson in race one, but Bulpin went one better in race two and took his first win ahead of Waghorn and Mike Dawson.